“Dry Boy” is a safe lime desiccant! 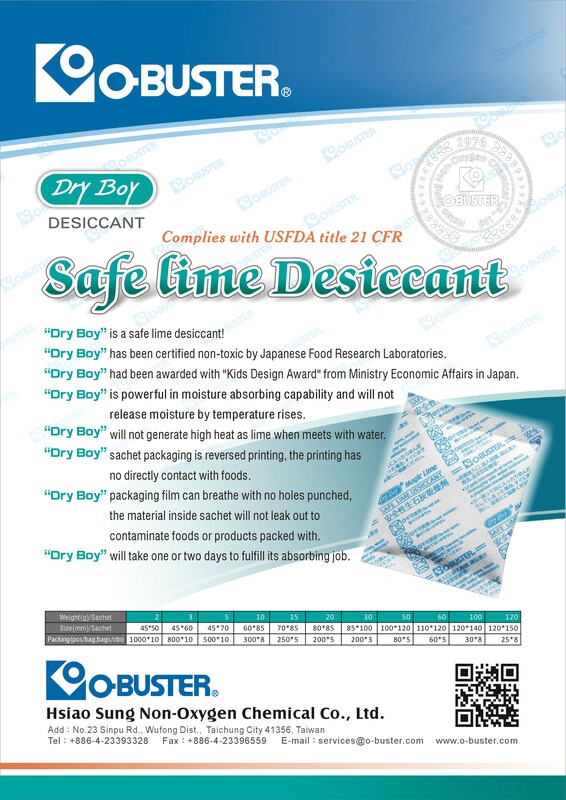 “Dry Boy” has been certified non-toxic by Japanese Food Research Laboratories. “Dry Boy” had been awarded with “Kids Design Award” from Ministry Economic Affairs in Japan. “Dry Boy” is powerful in moisture absorbing capability and will not release moisture by temperature rises. “Dry Boy” will not generate high heat as lime when meets with water. “Dry Boy” sachet packaging is reversed printing, no directly contact with foods, which complies FDA title 21 CFR. “Dry Boy” packaging film can breathe with no holes punched, the material inside sachet will not leak out to contaminate foods or products packed with. “Dry Boy” will take one or two days to fulfill its absorbing job.